I've learned that it's not very difficult to impress a 2 year old on his birthday. Really, a couple of presents to unwrap, a balloon or two, some cake with extra frosting and there you have a 2 year old's version of heaven! To bring the excitement to the next level, it helps when one of the presents is a fantastic gift that not only Harry, the new two-year old will love, but also everyone else in the family too! Harry received such a present when he got a box of the Stick n Stack 100 piece accessory set. As he unwrapped this particular present, he started smiling as soon as he recognized the picture on the cover of the box. I could already see the endless possibilities running through that little boy's brain. The kids originally received a box of the 100 piece Magnatiles translucent set for Christmas in 2013. Emme had just turned two years old and Harry was 9 months. While the box states that the recommended age is 3+, my children have been supervised while playing with them a bit younger than age 3 and we've found no issues there. At age one, Harry was stacking the tiles together and was amazed at the magnetic qualities. At two he can now build the basic structures. My three year old daughter will build multi-level structures and with a little help from mom and dad, anything they can think of, we'll build together. 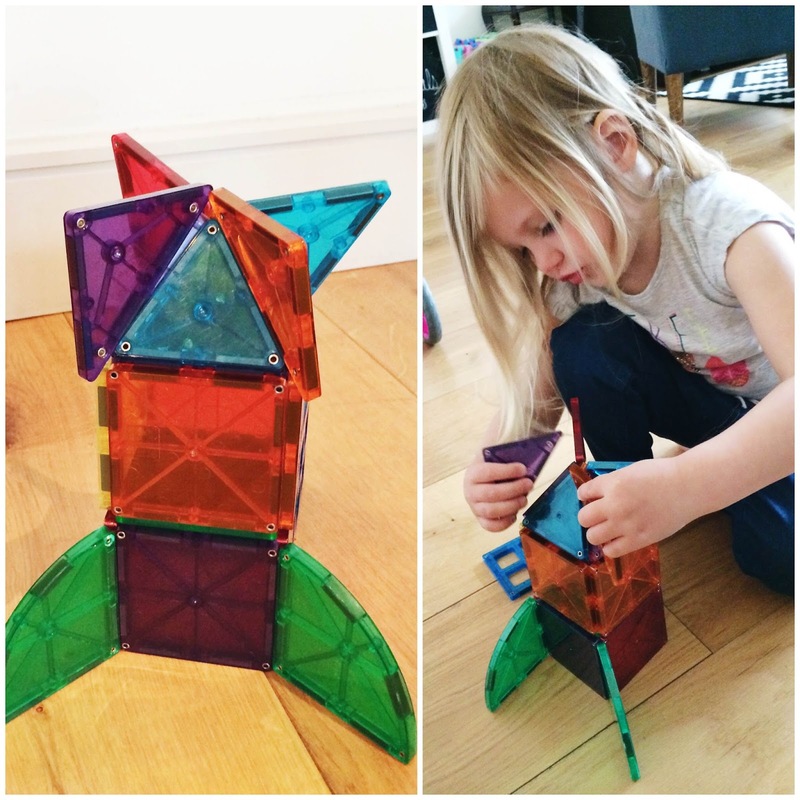 One of the best features of the Magnatiles is that they are a toy that has completely open-ended possibilities. The box has a couple of picture suggestions (a basic cube, a pyramid), to get you started but the rest is up to your child's imagination. We use the Magnatiles on their own to build rocket ships and castles, but they can also be incorporated with all the kids' other toys. We've used our animal figurines to build a farm and stables. We've built a magnificent home for the Disney princesses to host a fancy ball at. We've built extensions onto Duplo creations and building block structures and have added extra levels to a car garage. As a parent, I too love Magnatiles (if that wasn't already obvious!). They are a toy that grows with your children, each time the kids play with them I can see their building skills increase. Starting with flat 2-dimensional lays and growing to 3-dimensional shapes. I can already imagine how these toys will be incorporated into future math lessons involving angles, architecture and geometry. They are an excellent quality product. My toddlers unintentionally drop, smash, step on, and bury the pieces, but no amount of child destruction seems to alter these durable tiles. These flat, magnetic pieces are also an easy toy to clean up and store. I keep them in their original boxes, put away in a drawer, but they could easily all be thrown into any bag or box. The Stick n Stack set also includes 100 pieces but this set is an accessory box, used to enhance our Magnatiles set. Since adding the Stick n Stack set to our Magnatiles set, we have constructed even more amazing creations. Both sets are compatible with one another, so the magnets in all of the tiles stick to both brands' pieces. With new pieces like arches, doorways, car bases and connectors, we now have so many more options. We are now building pickup trucks and race cars with the addition of the wheels. Our castles and homes now have a more authentic look with the addition of the windows, doors and fences. I didn't necessarily feel like we needed an upgrade from the original Magnatiles, but the Stick n Stack tiles have greatly enhanced the original set just wonderfully. If you have been debating whether or not to buy a magnetic tile toy product, I would highly recommend the Magnatiles 100 piece as a starter set first. Don't hesitate any longer! Less than 100 pieces really isn't enough. Do you already own the Magnatiles or any other magnetic sets? What do you think of them? What are your favorite things to create using the pieces? Those look like great toys to build with, i like the idea of magnet. Not having to pull apart to hard or worrying if a tab will break off. and of course the colors are great! Love these blocks, was hard getting them, showing you and you taking them away without playing with them first! You'll just have to come visit and play!!! I bought the 100 piece clear magnatiles see from growingtreetoys.com for $102. Free shipping no tax. Use promo code 39B49 which saves 15% off your first order. They have other cool stuff too. This is my referral code so I don't think it expires. Thanks for that info, Ben! The 100 piece set is awesome!